Kolte Patil ITowers Exente : Luxuryapartments with high-end features for a modern-day lifestyle at its best! Bangalore is one of the most loved cities in the country today for all that it has to offer its inhabitants. This large IT hub in the country is soaring with beautiful infrastructure, transportation, public utilities and a lot more for a convenient lifestyle that is pretty hard to find in other cities these days. The real estate industry in Bangalore has come a long way over the past couple of years and has a lot to offer in terms of residential as well as commercial development. 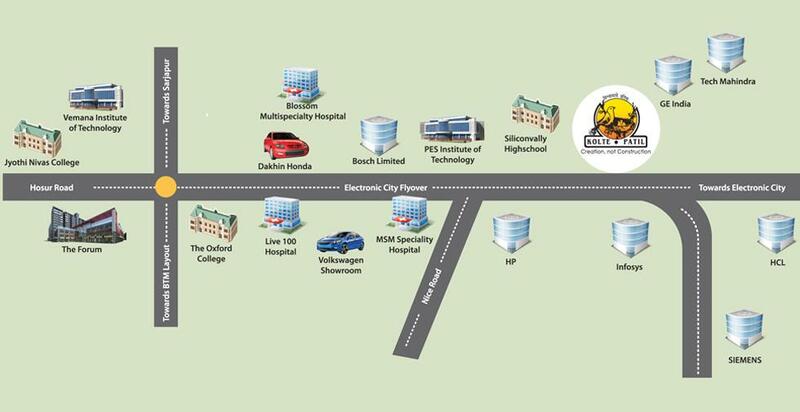 Kolte Patil ITowers Electronic City is a new residential project in Bangalore by Kolte Patil Developers Ltd. that offers sophisticated living spaces for the modern day. Extended over 4.04 acres of land, this development offers top-notch variants of 1BHK, 2BHK, 2.5BHK, 3BHK, 4BHK luxury apartments and penthouses with large area sizes that are crafted to perfection. 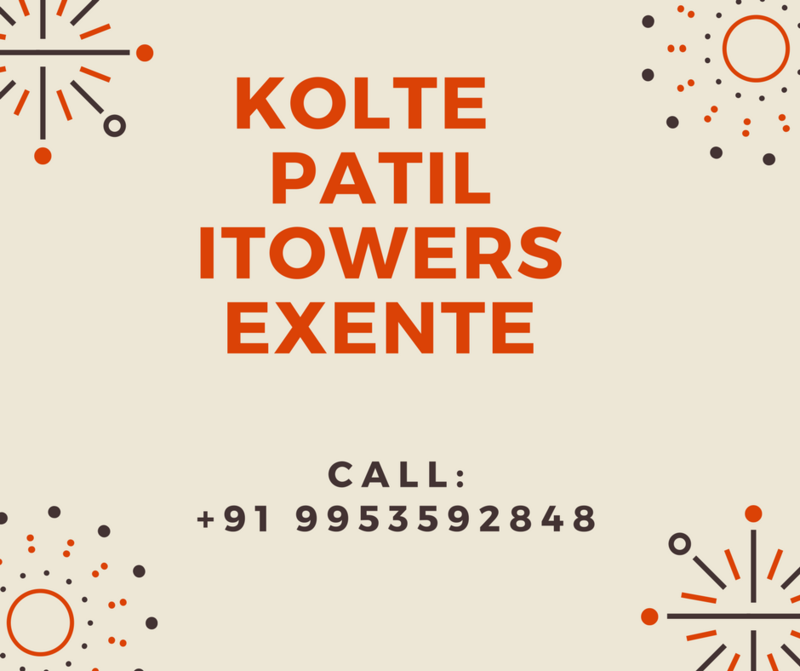 Kolte Patil ITower Exente Bangalore is a vibrant residential development that offers a beautiful range of internal and external amenities for a new world of luxury that you and your family will truly love and appreciate. The apartments are spacious and contain high-end furnishings and fittings, vitrified flooring, anti-skid flooring in washrooms and utility areas, wooden laminated flooring in master bedrooms, Teak wood framed main doors, Sal wood internal doors, UPVC windows, sleek kitchens with dado and granite counters, high-quality electrical wiring with ports and switches located perfectly, This development offers extravagant external amenities of pure luxury and comfort that will surely make you happy. They include a well-equipped gymnasium, swimming pool, library, jogging track, multipurpose hall, multiple sports facilities and a play-area for your kids, café, party lawn, ATM provision, convenience store and this list just goes on. Located at Hosur Main Road in Bangalore, this development comes in close proximity to a number of landmarks that you can access in the shortest amount of time possible. From schools and colleges, to medical centres, hospitals, malls, shopping centres, supermarkets, general stores, restaurants, cafes, banks, ATMs, public transport, etc. you can find and access multiple places without worrying about long distance journeys. Kolte Patil Developers Ltd. offers apartments of wholesome goodness that will meet your budget perfectly. 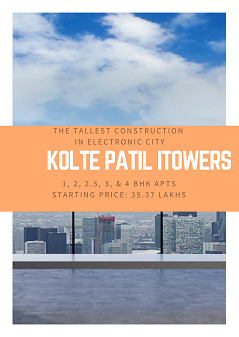 Just like its other developments, the Kolte Patil ITowers Exente price too is affordable and definitely worth a purchase for a modern-day lifestyle. You can choose from different payment plans along with easy home loans, NRI services and a lot more for a convenient purchase. Book your apartment today and experience a new environment of divine luxury like never before!